The laundry room is what I call a "high traffic area". It is the entry way from the garage (where I have my Costco overflow fridge) and where I do loads upon loads upon loads of laundry each day. 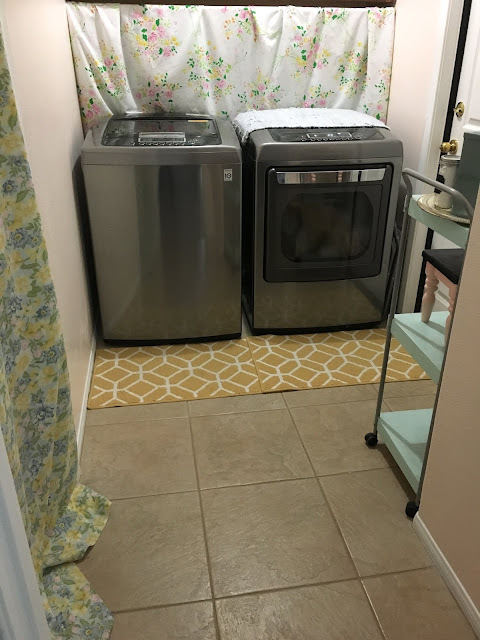 While I would love to completely renovate this space to meet all my clothes washing/folding dreams, that isn't going to happen anytime soon, if ever. So, instead I opted for little changes to make the room feel a bit more thriving for my taste. Because, I'm in there constantly. 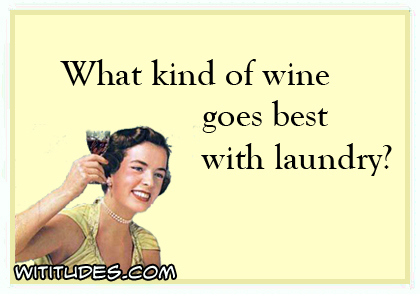 I do A LOT of laundry. 1. PAINT. Before we moved into our home we had it painted. 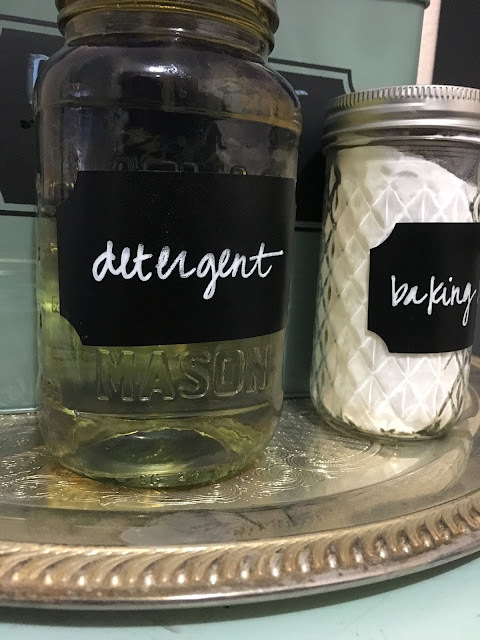 Since the laundry room is really "my room" I wanted it to be more feminine feeling than the rest of my "Smoke Grey" house. I opted for a soft coral and accented it with floral patterns. One thing I do regret looking back is not having the cabinets painted when we did everything else. I would much prefer a bright white...but I am surely not going to do that myself #ihatepainting. So, for now, Classic Oak it is (trying to make it sound nicer/fancier). 2. CEATE A CURTAIN. That dead space above the washer and dryer where cords try and hang out drives me crazy. 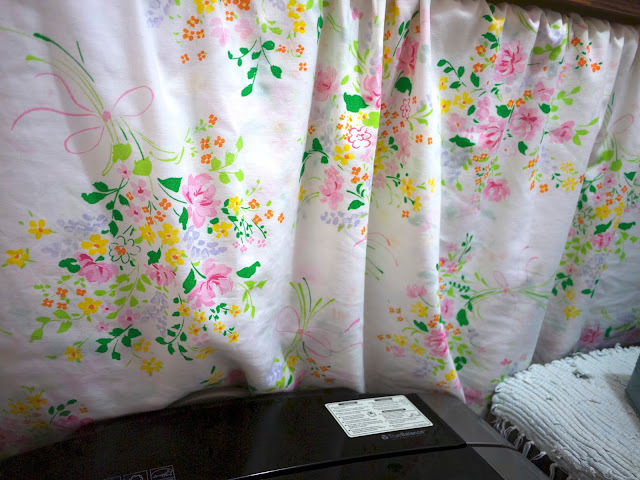 Since I have the cabinets to store my washing supplies, I opted against installing some nice shelving (which I would have done if the cabinets were not there) and decided to add some floral flare. 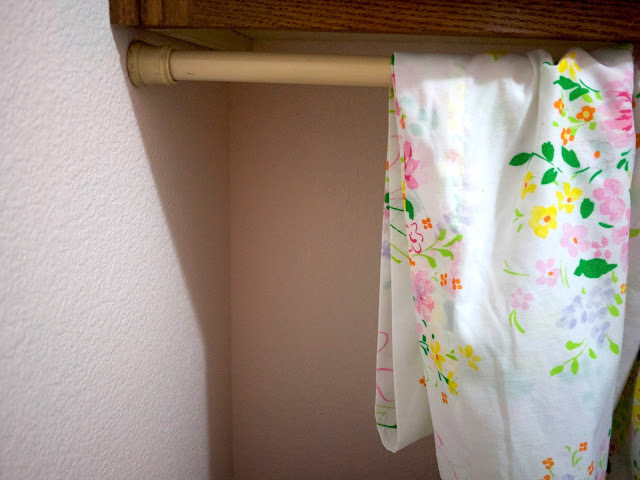 All you need is a shower curtain rod and a vintage sheet of your choosing. Fold and drape and done! 3. ADD CARPETS. Since I am a total clean freak, I hate the thought of my fresh laundry accidentally landing on the floor when transferring to the basket. Granted, my floors are also clean, but still. 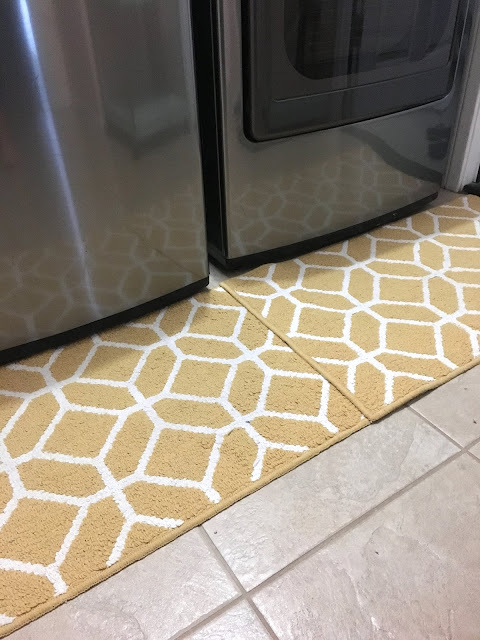 I added a little pop of color carpet in front of both the washer and dryer to warm up the space and keep my clothes safe from the (clean) floor. 4. CART CADDY. 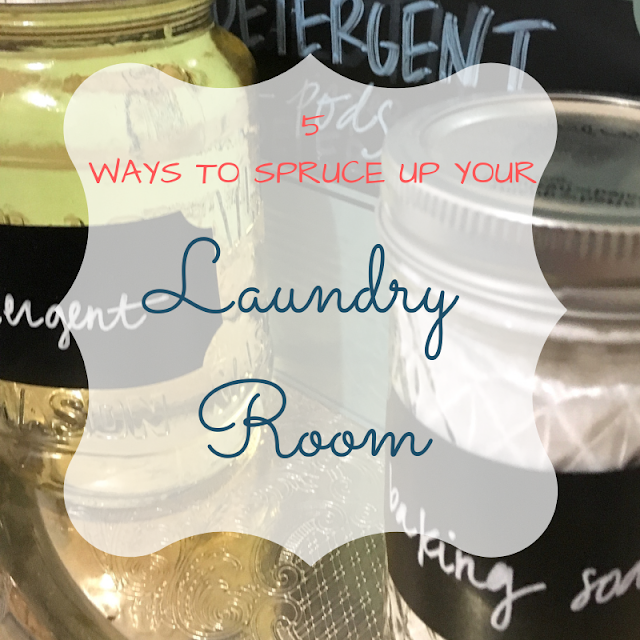 I have a small corner in my laundry room that needed to be utilized. Thankfully, I already had the perfect sized cart for the job. Sitting pretty in baby blue, this three level cart quickly transformed into a laundry caddy. 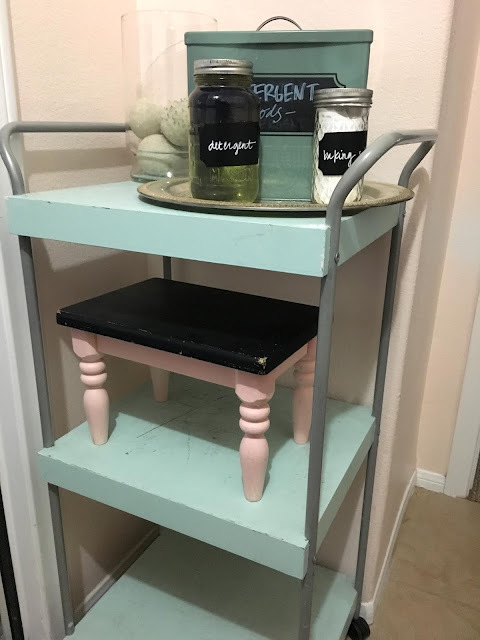 Supplies on the top, step stool in the center and baskets at the bottom. Functional for daily use and made the space just a bit sweeter. 5. 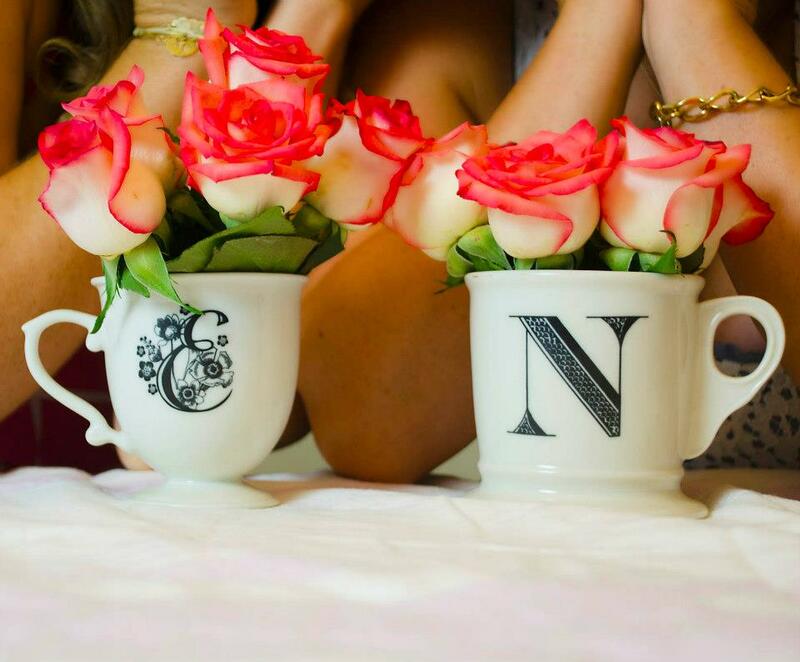 SASS UP SUPPLIES. Since I had my cart, I figured I might as well make my go-to supplies look a little sassier too. 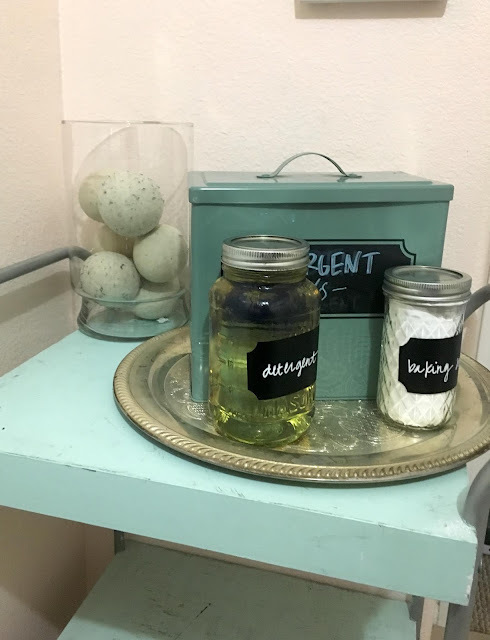 I used a large silver platter underneath my box of pods (I use those for my towels), jar of detergent along with a jar of baking soda. Complete with chalk labels to match! I threw my wool laundry balls in a large glass vase and just like that, I was done. 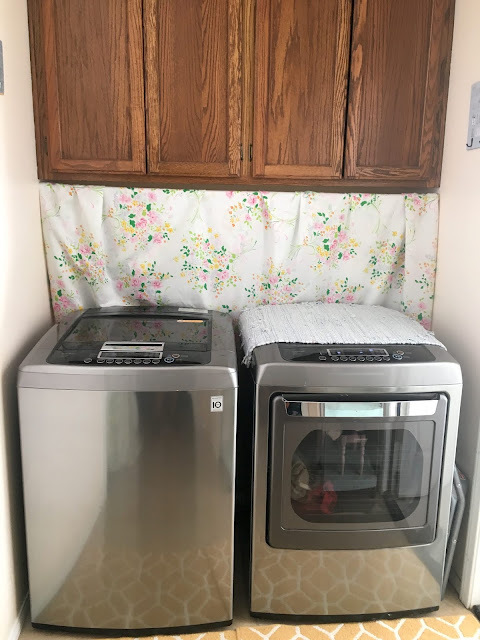 How is your laundry room space set up? Is it a little retreat or a headache?